Someone mentioned that the Gauls had legends of sunken lands. It seems though that the Gauls are all meditaranian in origin and so it would be much more likely that they carried with them the root legend of the Bible, and hence the flooding of Sunduland and the Arabian Gulf. Surprisingly, though Ireland has had a lot or Archeology carried out, most of it is on the massive abundance of visible remains. Ireland was so radically transformed by the first Neolithic farmers that most of what came before is now buried many meters down under blanket bog. Surprisingly little is known of the period before. What is evident was that Ice sheets covered almost all of Ireland, and would have prevented much perminant habitation, and destroyed almost all evidence of any that was there. Perfect conditions for the cold adapted Neandethals maybe. Yes, there were legends alright, but about Ys and Avalon and Lyonesse, and that must have happened many thousands of years after Doggerland got flooded by that tsunami caused by the Storegga Slide (6100 BC). The Neanderthals may have lived there in Ireland, but that was maybe 20,000 or more years ago. Paleontologists and Archeologists believe that the first humans came across a land bridge created by a mini ice age to the area of Antrim Ireland around 8,000B.C. Some think they may have come by wooden boat or raft. [LOL, the Fomorians??] By radio-carbon tests they theorize a racial continuity between the Mesolithic communities found in North Ireland, Wales and Scotland. If accurate, the timeframe of habitation in Ireland is pushed back to 10,000 years, in substantial agreement with findings of some Archeologists. Thirty years ago archaeologists excavating in County Derry found fragments of Mesolithic era huts and charcoal evidently from cooking fires that were later carbon dated to between 6,500 to 7,000B.C. A beach in County Antrim yielded thousands of flint tools including knives and arrowheads. Over in County Offaly archaeologists found a Mesolithic settlement at Lough ( Lake ) Boora. Evidence suggests that humans from Antrim spread south down the coast of Ireland to County Cork and up inland rivers to Connaught. At the mouth of Galway Bay on the west coast of Ireland lies the Aran Islands, where evidence suggests habitation in 6,000B.C. Co-incidentally, 6,000B.C. is about the earliest estimate of the arrival in Ireland of the first tribe of so called Celts. To summarize the Mesolithic period, the people of that era were hunters and gatherers. Some of the earliest symbols found on rocks suggest that the men hunted wild boar in the winter; Their hunting weapons were tipped with flint; Their diet was rich in meat, supplanted by nuts and berries gathered by the women of the tribe; They cooked outside and lived in small huts covered with animal skins. So it seems that they were homo sapiens. There time of migration was probably far enough apart for them to have been visably very different and possibly physically adapted to different conditions, hence the description of the Foromrian. It doesn't take to long for these divergances to happen - look at the Papau peoples and the South East asians. I seem to recall that the book of invasions describes another people called the Firbolg which came before the Foromrians. Possibly these are Neandethals. But according the the "Book of Invasions" (please read my former posts), the Fomorians were already living there long before Partholan, or the Tuatha De Danann and Firbolgs showed up. It seems its a long standing tradition to wipe out the "natives" rather than assimilate them. Yeah, and that is what MIGHT have happened, and why these Fomorians were being described as sea-faring brutes, pirates, good-for-nothings. On the other hand, according to stories in that Book of Invasions/Conquests these Fomorians lived together with the Firbolgs for quite some time without war. Most of this is inquery/question, I'm trying to connect modern research with ancient myths, to see if there's any grain of possible truth within these myths since it is said that many myths and legends started out as truth then became elaborated due to the alterations caused by oral tradition/"telephone effect/fish story effect". Frank Herbert, who, oh him the guy who tried showing our sameness through fiction, he's dead, does it matter? Be fair, Abe. At least 20% of the threads in the forum are "OMG, from my detailed 23 minutes of interwebz research, I totes discovered Atlantis in Gabon/Hobart, Tansmania/Fairbanks, Alaska/the asteroid Ceres/the next parallel dimension over but one." Pointing out a thread here is not about Atlantis is a positive service to posters. Ha ha ha, you put my home town in the middle of that thread. It makes more sense if it's an invasion by Hyperborian Mole men then repties from Niburu(orwhateveritscalledland). I personally like the land bridge idea for Native Americans, then most of the other stuff, or even better how most islanders throughout the pacific got to where they are today. Lots of cool strange things, like de Comte'!!! Geological Society, London, Special Publications, Vol. 175, No. 1. (1 January 2000), pp. 393-401. From the end of the Younger Dryas, tree cover (probably birch, willow, alder, hazel, juniper, pine) spread quickly, although initially it may not have formed a uniform dense forest. ("Birch woodland, with pine to the south-east.") Typical mammals at this time were "horse, aurochs, red and roe deer, elk, wild pig, otter, and beaver". There must have been much wetland area due to melting ice sheets and rising sea levels; these probably had plenty of waterfowl. The wetlands are particularly important for us because they preserved the archaeological evidence well. The estuaries of the large rivers moved inwards, making place to the sea; this was "favourable for human settlement". Around 6000 BCE there will have been "a mixture of hazel, oak, elm, and alder". ("Hazel woodland, with oak and alder, or oak and elm.") This may have attracted cattle. -3- Possibly the inhabitants were sea farers. -5- Maybe the survivors spread to surrounding countries (Norway, the present UK, Holland, Denmark, and Ireland). -7- The only flood legend pointing to that event that survived until this day can maybe be found in the Irish "Book of Invasions". Well, but that's all I can do here, look on the internet. OK, so I found something else (and I only hope the quoted texts on that website are close to the originals). There were three awful events in the Island of Prydein. The first was a bursting of the lake of floods, and the rushing of an inundation over all the lands, until all persons were destroyed, except Dwyvan and Dwyvach, who escaped in an open vessel; and from them the Island of Prydein was peopled. The second was a trembling of the fiery torrent, until the earth was rent to the abyss, and the greatest part of all life was destroyed. The third was the hot summer, when the trees and plants took fire by the burning heat of the sun, and many people and animals, various kinds of birds, vermin, trees and plants, were entirely destroyed. But if you read the whole story, I am getting the impression that the flood part is heavily influenced by Christian monks. And the flood talked about is maybe one happening between Ireland and and the British Isle or somewhere near Cornwall in the Channel, but not in the North Sea. At a later period the sea broke through the land, and Anglesea became separate from Wales; and in a like manner the Orkney Isle was broken, and many Islands were formed in consequence, and other parts of Wales and Prydein became Islands. The kingdom of Teithi Hen, ap Gwynnan, King of Kaerrihog. That kingdom was called at the time, the Realm of Teithi Hen; it was between St. David's and Ireland. No one escaped from it, neither men nor animals, except Teithi Hen alone with his horse; afterwards for all the days of his life he was weak with fear. The second kingdom was that of Helig ap Glannog, it was between Cardigan and Bardsey, and as far as St. Davids. That land was very good, fertile and level, and it was called Maes Maichgen; it lay from the mouth of the Ystwyth to Llyn, and up to Aberdovey. The sea destroyed the third kingdom: the kingdom of Rhedfoe ap Rheged. The Triads are very specific about the "bursting of the lake of floods." This is not an addition put in by the Christian monks in later times, though they must have viewed it as proof of the Biblical Flood. If the map is correct, Llyn Llion - the Lake of Floods would have been a large freshwater lake between present day Ireland and the British Isle. The melting of the glacial ice cap that blocked the Northern Channel between Ireland and Scotland could have caused "the rushing of an inundation over all the lands." Most importantly: the source of this myth, the story of Dwyvan and Dwyvach is of Silurean origin. These are the people mentioned whose ancestry is the oldest and whose racial memory would stretch back to such an occurrence, long before the Celtic presence. The Irish have a memory of this time in the story of Cessair. A closer look at the Lebor Gabála Érenn indicates that Cessair escaped with fifty women and three men to the Western shore of Ireland, two other ships were lost. If the Christian bias is removed, it is revealed that Cessair did survive, wandering to Cul Cessrach in Connachta where she died. Cessair is also known as Banbha, a mother-goddess of the Fomorians who mysteriously never took part in the Invasions of Ireland - they were always there. The best estimate given to when such an inundation took place have a wide range. Anywhere from 10,000 BC to 5700 BC. (Can't help but point out that "Radiocarbon dating of sediments taken from the coastline of eastern Scotland put the date of the Storegga Slide at about 5,800 BC." [>> the precise date of the slide is 6100 BC] Was this another consequence of that event? Now, IF this person who created that website is right in his assumption that those Welsh legends point to some disasterous flood between Ireland and Brittain, and happening between 10,000 and 5000 BC, then there should also be similar legends about what happened in the North Sea at about the same time (and maybe by the same cause). That assumes that the legend was transmitted to the invaders,who came thousands of years after the events described rather than been brought with them and then transposed to local conditions. Yes, that could have been a possible scenario. But it's still possible the ones who were able to escape told the people in the surrounding counties about what had happend to them and their country. These people were in contact with eachother, "Doggerlanders" might have had family or related tribes living on what now are the coasts of the North Sea. or, -2- The refugees told about what had happened to them to the people in the countries they fled to ( or 'invaded'), and thus the stories of the refugees got absorbed in the mythology of the native peoples. I have done some thinking (yes, I cannot only Google, but think too!! ), and if it's true that Doggerland was (partly) inhabited by a sea-faring people, what about the beliefs of these people and did anything of their beliefs survive? Well, I live in Holland, and I remember there were shrines of a ancient goddess called "Nehallenia" in what's now a province called "Zeeland". I also remember that this goddess and/or name was pre-Celtic and pre-Germanic, and may have been a goddess for much more ancient Europeans. The altar in the pictures shows Nehallenia standing with her left foot on the stem of a little boat. This indicates that Nehallenia, originally a goddess of fertility (apples in her hands) and patroness of home and family, later on became the patrones of sailors. Unknown is whether Nehalennia is a Celtic or Germanic name or neither. Other Indo-European peoples might have inhabited the area around the second century B.C.E., giving a latest start date to her cult. It is also possible that the name is not of Indo-European origin. Roman writers identified indigenous people at will or for political reasons as Celtic or German, mostly regarding the Rhine as a natural division. Modern archeological methods revealed Celtic cultural findings on sites where Romans described people to be Germanic, or the reverse occurred, but leaves us without a clue about the language actually spoken. As well should be recognized Nehalennia is just a Latin transcription of a foreign language and would probably have lost much of its local vocalization. The name might originate from a combination of Proto-Celtic, Proto-Germanic or otherwise Indo-European roots or stems. It should be realized that at least the Celtic and Germanic tribes shared a common heritage in language as well as ancient religion and where culturally intertwined, retaining however some noteworthy differences. The name can be split up in several short syllable combinations to correspond with recognizable roots or stems. Proposable are the PIE roots *nek (death, to bring) or *nebh (sky/cloud), leaving suffix "ennia" open to investigation. To the Indo-European root *nek corresponds a reconstructed proto-celtic equivalent stem *nek-e/o- (to kill). Notwithstanding references towards the afterworld at the votive statues dug up, so far this explanation doesn't make sense for the fertility attributes ascribed to the divinity. Leaving its first two syllables together, the composite "Nehal" could yield both a Germanic and a Celtic explanation. A Germanic etymology towards "Nehal" could be proposed departing from stem *nihw-ela- (*nigw-ela-), meaning "to destroy." In modern Dutch for instance this stem survives in "vernielen," meaning the same. This explanation would fit the funerary motives and symbols on the altar and offers identification with the female triple-goddesses of Indo-European tradition (see also Moirae, Norns) or, more precisely, to the incarnation of the future like the Nordic Skuld, as Valkyrie being the only Norn dedicated to recruiting fallen heroes on Hellhoundback for the future battle of Ragnarok. Far less is known about Proto-Celtic. The same applies to Celtic mythology. In case of a Celtic origin, however, we find a clue at hand with proto Indo-European (PIE) *nebh- (sky/cloud). One argument in favor could be the popularity of Celtic names of divinities derived from this root, like Abnoba, a local female deity whose worship was within the Black Forest and dedicated to a river and forests, that originates from a Celtic dialect containing root *nob (wetness), derived directly from the PIE root. Another argument would be the wider development of this PIE root towards occurrences in known Celtic languages meaning Sky (being "nem" in Old Irish; "nef" in Welsh, Cornish en Bretons) and "Cloud" (Old Irish: nēl, gen. niuil m ; Welsh niwl, nifwl; Cornish niul). Notable is the typical Celtic evolution of strong dentals towards aspired consonants. "Nehal" then would correspond neatly to modern Dutch "nevel", Latin "nebula" etc., thus sharing words having high international cultural significance and a notable IE history. Compare also mythological names derived from the same PIE root, like Niflheim, the vaguely defined but widely renowned Nibelungen pedigree and the Dutch river Nabalia mentioned by Tacitus for being picked as location for signing the peace between Batavians and Romans after finishing the Batavian rebellion. Consider rivers in general relate to the cult of a river-goddesses in most of Europe. In Celtic mythology, Abnoba was a forest and river goddess, worshipped in the Black Forest and surrounding areas. In articulatory phonetics, a consonant is a sound in spoken language that is characterized by a closure or stricture of the vocal tract sufficient to cause audible turbulence. ... Niflheim (Land of Mists) is the realm of ice and cold in Norse mythology. ... German Nibelung and the corresponding Old Norse form Niflung (Niflungr) refers in most of the German texts and in all the Old Norse texts to the royal family or lineage of the Burgundians who settled at Worms. ... The Batavii (or Batavi, Batavians) were a Germanic, or possibly Celtic tribe reported by Julius Caesar and Tacitus to have lived around the Rhine delta, in the area which is currently the Netherlands. In its meaning related to *nebh, "Nehal" must have had for sure a second association in pagan times to more destructive forces, like those depicted by the underworld. This double nature of meaning would reflect an ancient pagan, Indo-European mind already waning in historical times. In Latin, much better known than its Germanic and Celtic contemporary counterparts, some of this heritage could have been preserved in the duality between the words "nebula" (mist, fog, vapor) and "nebulo" (scoundrel, villain, roughneck). If the local Celtic dialect (Celtic being related closer to Latin than to Germanic) would have retained this negative synonym, the previous explanation of "Nehal" from Proto-Germanic *nihw-ela- (to destroy) would find a Celtic equivalent. Even, being unknown any PIE-equivalent to this Proto-Germanic stem, this stem could have been adopted directly into the Germanic world from Celtic, thus yielding a similar Celtic etymology with a notion that Nehalennia indeed figured as an incarnation of fertility (goddess of water and fruits) als well as a divinity of death (Valkyr). Finally, suffix -ennia may be of any Latinized foreign origin or may not have any hidden meaning at all. Similarity with the Irish mothergod and queen of fairies Anu - including myths relating her to sons able to change back and forward to hounds thus explaining the hound-motive as a reference to motherhood - remains equally speculative. Similar suffixes are common to most contemproary matrones deified as triple goddesses in the Rhineland, such as the Matronea Veteranehae, etymologically related to the Brythonic god Veteris, where the suffix could tentatively be reconstructed from an intensifier *an(n) identified in proto-Celtic. Other Rhineland matrones suffixes suggest a different etymology, such as Matronae Alhiahenae, Matronae Audrinehae Matronae Aufaniae, Matronae Axsinginehae, Matronae Fernovinehae, Matronae Udravarinehae, Matronae Vacallinehae, Matronae Vallabneihae. And where did people worship this goddess? Well, it's in an area that some call the "Nordwestblock". The Nordwestblock (English: "North-West Block"), is a hypothetical cultural region, that several 20th century scholars propose as a prehistoric culture, thought to be roughly bounded by the rivers Meuse, Elbe, Somme and Oise (the present-day Netherlands, Belgium, northern France and western Germany) during the Bronze and Iron Ages (3rd to 1st millennia BC, up to the gradual onset of historical sources from the 1st century). The term itself Nordwestblock was coined by the German linguist, Hans Kuhn, who considered the inhabitants of this area neither Germanic nor Celtic, thus attributing to the people a distinct ethnicity or culture. According to Kuhn and his followers, the region was Germanised from the beginning of the Common Era, at the latest. Well, read the rest yourself (links), but I think it's nice to know there once might have lived a people in that area who were neither Germanic nor Celtic. Only the period is thousands of years off, but it is possible they may have lived there for lots longer, and.... may have been the descendents of thse "Doggerlanders". OK, I'm not completely nuts, I know this Nehallenia goddess could well be no older than let's say 2500 years, and having nothing to do with anything happening 8100 years ago. The Dutch coast has been flooded many times after 8100 BP, so that goddess could have come into existence (as a patrones and protector of sailors and people living close to the coast) many centuries after 8100 BP. But hey, I'm only trying. I must add that the socalled "Northwest Block" was being invaded by the Frisians, a west Germanic tribe, from 700 BC onwards. And hundreds of years later they occupied the SE coast of the North Sea, from Belgium up to Jutland in Denmark. But even in their mythology nothing was left from what they could have heard from the people they encountered when they spread along the North Sea coast. Not that I know of, anyway. "The interpretation of the reliefs is extremely difficult, but one thing is almost certain. Since the woman is depicted in an apse, a place that was normally reserved to the gods, we may assume that she is the goddess (and not a priestess or a mermaid). However, it is not possible to establish whether she protects or tramples the ship near her foot, and we are therefore left with the question whether she caused the tempest or its silencing. (The fact that the sculptors depicted ships not wrecks suggests the latter, but we can not force this argument.) The meaning of the fruits is a mystery too: are we to think of the 'apple country' Avalon that is known from Celtic sources as some sort of heaven, or is it a reference to the transience of life? And what to think of the dog? Is it a protective animal, or is it one of the threatening 'dogs of the sea' mentioned in the description of the North Sea by the Roman author Albinovanus Pedo? Again, we do and can not know." FIG. 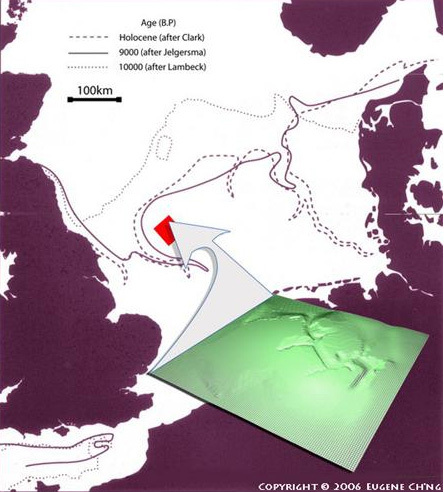 4.— Hypothetical extension of the land bridge, that is, Doggerland, during the Holocene/late Mesolithic (10,000 YBP) and hypothetical expansion routes (modified from Coles 1999). Coles (1999) proposed that the occupation of this land bridge may have played a role in delaying the onset of the Neolithic in Britain and Scandinavia, as a consequence of encounters between the Mesolithic northern populations and the agriculturist newcomers. Case (1969), in reference to the mixture of different traits of the British Neolithic, suggested that some of the donor cultures may have lived in coastal regions that are now submerged or eroded. Modern populations in the United Kingdom and Scandinavia may therefore share ancestry with people who lived in this region perhaps as recently as 7,500 YBP. This might also explain the presence of specific Neolithic haplotypes (such as J1b1) exclusive to the British Isles and Scandinavia (Helgason et al. 2000; Töpf 2003), previously thought to represent posterior links between these populations. Common ancestry could of course reflect common origins anytime between the Last Glacial Maximum (LGM) and Saxon periods, but we focus on the period when Doggerland was exposed due to the supporting archaeological evidence and the opportunity for northward expansion availed by the land bridge. McEvoy et al. (2005) also suggested that the genetic landscape of southeast Britain may have been shaped by older links with the continent, when Doggerland still existed. Genetic continuity has been proposed to exist among northern populations for other species as well (e.g., for Rana lessonae; Snell, Tetteh, and Evans 2005). The Mesolithic Period in Europe has been a much-discussed area in archaeological research. As far as is known, the project reported herein represents the first attempt to visualise an otherwise inaccessible Mesolithic site with GIS and Virtual Reality (VR) technology, exploiting real geo-seismic data sources of the Southern North Sea. This paper presents the techniques and technology used in reconstructing an ancient river valley discovered while gathering seismic data for petroleum in the North Sea. The virtual landscape reconstruction is populated with vegetation types based on pollen records of the same period in nearby region, and 3D models of Mesolithic dwellings have been grouped into villages and positioned near possible settlement areas. The final VR environment has been "brought to life" via real-time interactive walkthroughs, complete with environmental and spatial sound effects. This paper also describes the various software applications and hardware used for implementing the high-quality static models and the high-performance interactive world, the latter intended for delivery via the WWW and multimedia for educational purposes. There was this Swedish geologist who published his theory about Atlantis, a couple of years ago. He tried to prove that Ireland was the actual location of Plato's Atlantis, and that their flood story originated from the deluge that flooded Doggerland, in particular it's main feature, the present Doggers Bank, a long undulating hill. He also assumed that the socalled "Silverpit Crater" was the real location of the city of Atlantis. He said that it exactly matched the discription of Platos's City of Atlantis, with its THREE rings. Well, maybe it's the liquor, but I see many more rings. And apart from that, it would have been a big depression in the north west of Doggerland, more of a lake than a geological structure above land (Doggerland) with walls and ditches/canals. He would also have been disappointed about the possible culture overthere, Mesolithic/Neolithic hunter-gatherers, or maybe even farmers. But they didn't build temples and huge stone structures (or else those stone structures would have been found already). No, they build huts made of wood, twigs, maybe bones. Heh. Just to say that even scientists can go blind when they get a bit too enthousiastic about a pet theory. I do realize this thread is a big disappointment for those who want to read about aliens, and magic crystals, flying saucers, and an advanced, and now submerged super-civilization. But guys and girls, THIS is what you get when scientists actually explore submerged lands. Now YOU post something about any proof you have of a 'lost civilization'. I will bet that you can't. Doggerland has been explored and described in detail, just read this thread. It was a huge stretch of land, and it got flooded in the most catastrophic way, around 8100 years ago. Any legends that described it? NO. not really. I am afraid that this would be a conjuncture. We neither know all legends nor do we know what the known legends refer to. Abramelin, you did a good job. Most interesting information. I think I would recognize a legend about what happened in the North Sea, many millennia ago. And most legends about floods/deluges are about what might have happened between Ireland and Wales, or of the coast of Cornwall (Avalon, Ys, Lyonesse). And even then, it was much later in time than the flooding of Doggerland. It's just too long ago.